In Austin a good deck is a way of life. From great parties to first steps, memories are made on the porch. Sturdy and stylish, our decks will revolutionize your evening glass of wine. We are starting to create individual Texas native plants profiles and today we will put the spotlight on Century Plant (Agave americana). What do you think about Century Plant? Do you grow it yourself? Pictures or insights to share? Hello again fellow Texas native plants enthusiasts! 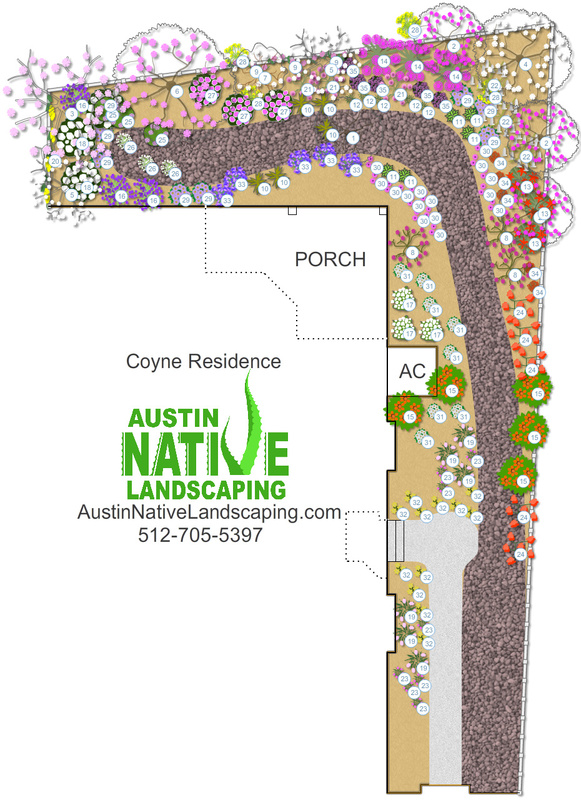 This is part 2 of Austin Wildscape Landscaping For Wildlife. You can read part 1 here. Please note, there are many more plants you can use. 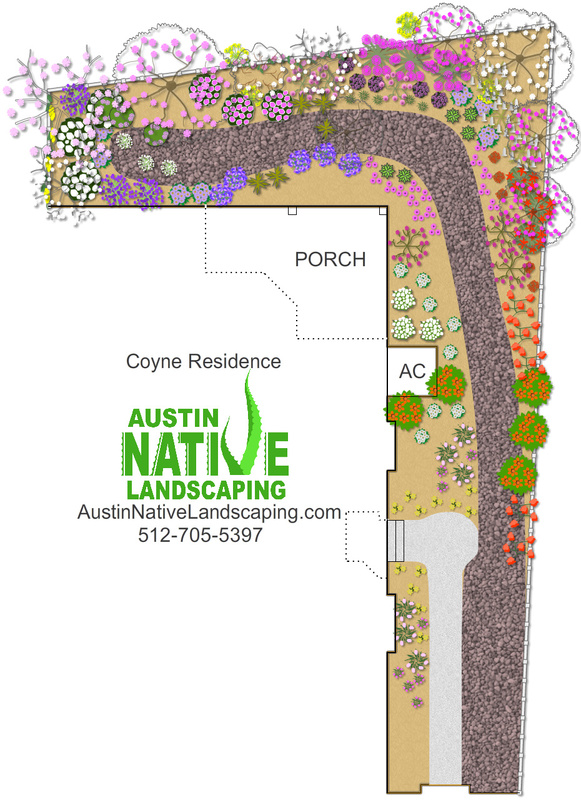 We used perennials that not only look aesthetically appealing in a landscape situation but are also relatively easily obtained in Central Texas nurseries. There are many many more plants, especially annuals that are excellent for wildlife but require more overall maintenance and gardening sass (independent propagating from seed as a reliable potted plant sources are scarce and yearly replanting due the plants annual nature, for example). 1. Food – Pollen, Foliage and Berries. It is important to remember that different plant provide those components during different times of the year. It will be much more beneficial to have a bunch of staggered blooming and fruiting to assure an almost around the year sustenance. In all of our wildlife designs we try to mix a bunch of plant families together to brew a truly magnificent wildlife buffet landscape. 2. Habitat to provide cover and protection from weather and predation. Evergreen plants tend to excel in that category. 3. Reproductive areas where various critters could nest and birth. 4. Water. Little ponds, water features or even some plain old birdbaths will provide much needed moisture during our poaching summers. 2.Texas Mountain Laurel. Another classic and a personal favorite of ours. Spring Purple flowering on a beautiful small statured evergreen tree makes Texas Mountain Laurel a wonderful choice. Highly deer resistance. Slow grower. poisonous seeds. 3. Texas Redbud. No need introducing this classic and popular flowering small tree. Covered with unique looking pink blooms at early spring. Texas Redbud is a solid pick for any landscape regardless wildlife emphasis. 4. Texas Persimmon. Not a real popular landscape tree but a must have for any Wildscape. Very drought resistant. Female trees will bear edible fruit. 5. Anacacho Orchid Tree. An attractive and drought resistant tree. Completely covered with white blooms at spring. Anacacho Orchid Tree is also highly deer resistant. 6. Desert Willow. This truly xeric plant is absolutely drought resistant and has very long season of pink-white trumpet shaped blooms. Desert Willow is highly recommended. 7. Texas Kidneywood. This small tree has a very long blooming season from spring to fall with its white flowers. Those flowers smell beautiful and the butterflies agree. 8. Perennial Winecup. This deciduous ground cover is a larval host plant for the Gray Hairstreak Butterfly. 9. Texas Wisteria. This extremely drought resistant vine will attract a multitude of insects and butterflies. 10. Softleaf Yucca. This yucca, you guessed it, has soft leaves unlike most of the other yuccas. An attractive white bloom will appear in the summer. 11. Twistleaf Yucca. This smaller yucca is a larval host plant for the Yucca Giant Skipper. 12. Little Bluestem. Skipper Butterfly love it and will skipper town just to feast on it during the fall. 13. Flame Acanthus. An outstanding shrub that provides food for butterflies and hummingbirds alike. Flame Acanthus has a very long blooming season. 14. Butterfly Bush. Its in the name… This god sized shrub will attract a number of different butterflies. 15. Wooly Butterfly Bush. This shrub is like a more surly version of the Butterfly Bush above. Orange flowers. 16. Black Dalea. Provides ample nectar in Summer. Truly a Xeriscape plant; it will survive in very adverse water conditions. 17. White Mistflower. This great medium size shrub will explode with white blooms during the fall. White Mistflower attracts both butterflies and hummingbirds. 18. Elbow Bush. Bees, insects and butterflies will enjoy this shrub’s nectar while various birds will feast on the attractive purple berries that form in the summer. 19. Gaura. Butterflies adore Gaura and its neat appearance makes you adore it as well in your own landscape. 20. Carolina Jasmine. An excellent evergreen flowering vine that will shower your landscape with its fragrant yellow flowers in early Spring. Hummingbirds love it. Poisonous if ingested. 21. Trailing Lantana. One of our very favorite ground covers to use. Will take full sun or part shade and will provide many months of beautiful and delicate purple blooms. Attracts butterflies! 22. White Honeysuckle Bush. A deciduous good sized shrub that will have white blooms in the spring and red berries in the fall. Birds, bees and butterflies will feast on this water wise perennial. 23. Gayfeather. Provides nectar to insects and various butterflies. This short perennial loves full sun and blooms from august till frost. 24. Turk’s Cap. Extremely long flowering period means god’s little creatures can fatten themselves for a good while. Turk’s Cap thrives both in full sun and in heavy shade. 25. Rock Rose. On of the few perennials that enjoys both full sun and heavy shade. Butterfly plant. Nice little blooms, but a relatively short blooming season. 26. Frog Fruit. An unusual groundcover that thrives both in full sun and full shade. Butterflies love its long blooming tiny white blooms. 27. Mexican Oregano. A jack of all trades type of plant. Evergreen, deer resistant, edible and very drought resistant. Mexican Oregano also smells great! 28. Yarrow. This evergreen perennial will grow well in both full sun and heavy shade. Painted Lady Butterfly loves laying its future babies on it. 29. Fall Aster. Another highly recommended plant and a personal favorite. Fall Aster’s amazing looking purple blooms that completely cover the plant in fall. 30. Purple Coneflower. A true classic in its appearance. 31. Garden Phlox. Butterfly plant. Good looking pink flowers in the Summer. 32. Blackeyed Susan. A compact perennial that graces the landscape with its bold yellow blooms in the summer. Butterflies love dat nectar. 33. Henry Duelberg Sage. Butterflies and Bees love its sweet nectar from its very attractive dark blue flowers. 34. Tropical Sage. Will take full sun and full shade. A small and wooly looking perennial. Attracts hummingbirds and butterflies alike. 35. Verbena. An excellent butterfly plant. Very long blooming season from spring to frost. Semi evergreen. So what can you do now, you might ask? Well, most of those plants are easily obtained all over Central Texas so you might make this design your reality in a week. You can get some good books to further deepen your knowledge about Texas native plants in general and wildscaping in specific. You can get a design from us that will set you back a few hundred rupees or contact us for your free estimate for a full blow design-install from scratch to beautify your own property. After a long break, we are happy to continue our individual Texas native plants profiles and today we will put the spotlight on Firecracker Fern (Russelia equisetiformis). What do you think about Firecracker Fern? Do you grow it yourself? What kind of experience and insights you have to share? We love featuring our readers’ plant pictures and Xeriscapes! Firecracker Fern (Russelia equisetiformis) Plant Profile!